The Pacific Northwest got a little less lively on Monday, September 2, 2013, with the death of Joan Lenore Eckerson Anderson, age 88. Born at home in Centralia, Washington in 1925, to Harold L. and Katie “Babe” Ives Eckerson, “Jo” or “Josie,” as she was known, descended from several old Fords Prairie and Centralia pioneers. These included her Eckerson, Ives, Channell, Foglesong, and Myers ancestors, many of whom had come to the area long before 1900. Her mother always said that Jo's arrival was the first of many of her life's dramas, because it occurred during a flood in January, and the doctor had a hard time making it to their house. Joan attended Fords Prairie School, and graduated from Centralia High School in 1944. 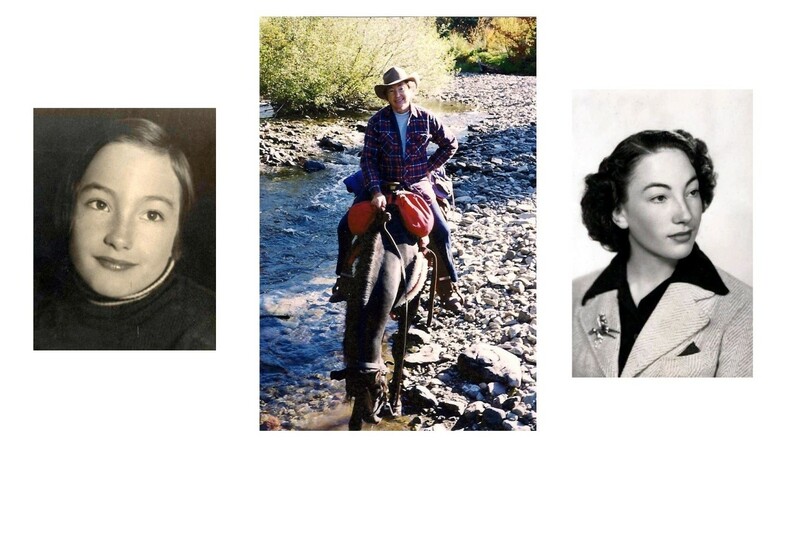 She had many happy memories of growing up as a rural Washington tomboy, even during the Depression, spending time with loving relatives, her friends, and mostly, her beloved horses. From an early age, she found a lot of joy on horseback, a passion that lasted throughout her life. Whatever was bothering her, time spent in the barn was the answer. As an older teenager during the years of WWII, Jo worked at a couple of jobs traditionally held by men. She rode a bus to Chehalis to work as a “Rosie the Riveter,” at a war-time plant established by Boeing. There she built aircraft components, proud of her ability to work faster than some of the men. Jo also worked at a service station west of Centralia, where she had two life-changing experiences. In 1942, she was held up by two men, who threatened her with a gun held to her back, and told her not to talk. Not one to like being told what to do, Jo promptly called the police after their departure, and the pair was arrested within two hours. The second life-changer was when a charming young soldier from Chicago came in to the station, looking to have a repair made to the Army vehicle he was driving. Although Jo had met many lonely young men stationed at nearby Fort Lewis, there was something special about Jack C. Francis. During her one year at Washington State University at Pullman, she half-heartedly studied home economics, and worried over his safe return from the battlefields of Europe. They married in November of 1945. Married life brought a different set of adventures and challenges. Jack had a case of “itchy feet,” and they moved regularly, once to Alaska. Two children came along right away: James Patrick and Mary Catherine, followed later by Jennifer Jo, and finally John David. To make extra money, Jo did some home remodeling jobs. Later, it didn't occur to her children to find it odd that their mother could build a brick fireplace or mix cement. This was long before the “DIY” movement. Jo also grew a huge garden, and did a mammoth amount of canning every year. What she didn't plant, she bought by the box directly from the grower. We dreaded peeling peaches in the heat of August, but loved opening up those jars in January! In 1955, Jo and Jack followed her parents, and moved to the Napa Valley of California, where they all decided to take a break from the rains of Washington. Not long after, Jo began her working career with the State of California, training as a psychiatric technician at the State Hospital in Napa. This was back in the days when that job required a full nurse’s uniform, which involved a white dress, white stockings, and starched cap. I still remember her freshly-washed cap, plastered to the refrigerator to dry smooth and flat. After several years, Jo was given the opportunity to organize an on-site center at the hospital, where donated clothing could chosen by the patients in a store-like setting. Known as the “Dolly Shoppe,” it was a great success. The family moved to Camarillo, CA for a year in the late 1960's, so that she could duplicate the shop at the hospital there. Vacation time always involved sleeping bags and either a tent or a trailer, and hitting the road for the great outdoors. Our mom did a couple of things right in particular: as kids, we felt well-taken care of, despite having very little money. It never occurred to us that we were eating bait (smelt), or cheap cuts of meat (the sparest of spare ribs and round steak), because she made it fun by giving them crazy names like, “fence-post meat.” We were taught from an early age never to utter a racial slur, and to have compassion for the underdog. Jo and Jack eventually parted ways. In 1966, Jo married David C. Anderson, with whom she shared many happy years until his death in 1990. During their marriage, Jo was able to return to her love of riding and owning horses. After her retirement, she and “Andy” traveled in an RV to many parts of the United States, frequently to various events devoted to the Tennessee Walking Horse. In the mid-1980's, they made the decision to move back to Washington. While still in Napa Valley, Jo had operated a saddle shop called Plum Creek Saddlery on their property. She moved the operation with her to Washington. She made many friends throughout the Pacific Northwest, swapping horse stories over the sales. She was later briefly married to Clarence Guenther of Onalaska, WA, with whom she shared memories of old Washington acquaintances, and also made a return trip to Alaska. The biggest tragedy of Jo's life was the loss of her son, Jame Patrick Francis, in Viet Nam combat in 1969. Although devastated, she picked up the pieces and moved on. This same energy enabled her to develop properties relatively late in life. As a single woman, she had a house site carved into a slope, had buildings built, had landscaping put in, and moved a horse onto the property, all in her early 70's. Jo was preceded in death by her parents, Harold and Babe Eckerson, her brother, John Eckerson, her second husband, David C. Anderson, and her son, James Patrick Francis. She is survived by her daughter, Mary C. Lesch and her husband Bill, whose loving and attentive care helped Mom live way beyond her nine lives. She is also survived by daughter Jennifer J. Pina and her husband Davie. Jennifer is honored to have assumed the role of family historian, and firmly believes our ancestors had a sense of humor. Also surviving is her son John D. (Francis) Anderson and his wife Joyce. John is our master of revels and tech wizard, who provided Mom with a steady supply of milkshakes and old-time radio recordings. Jo also leaves six grandchildren: Christine, Michael, Daniel, and Timothy Lesch, and Rebecca and Irene Anderson, as well as several great grandchildren. The word “feisty” might have been created with our mom in mind. At her annual health assessment conference five weeks before she died, Jo had this typical exchange: when the social worker asked her what year it was, Mom (who was clearly stumped) saved herself by saying, “If you don't know what year it is, you need to go figure it out, I'm not helping you!” One health provider commented that we must have learned to think on our feet, growing up around our mother. She never let the truth get in the way of a good story, nor did she miss an opportunity to let fly with a zinger. At the end of the day, there was no more loving, fun, and generous mama grizzly. You only have one mother, and ours was unique. The family wishes to extend their thanks for the excellent care provided by the staff at both Delaware Plaza Assisted Living, and Frontier Rehabilitation Center of Longview, WA, and by David Westrup, M.D. As her son John said, they helped Mom coast in for a smooth landing. It isn’t only the kids who are headed back to school. Those of us who have been involved in researching our family history for a long time (33 years, in my case) can also benefit from hitting the books. First up: Hey America, Your Roots Are Showing, by well-known researcher and author Megan Smolenyak. Not a “how-to” book, but more of a “greatest hits” collection, from among her past research cases. She tells about a fascinating variety of subjects and approaches, in a brisk and breezy style that’s not too demanding. Probably my favorite chapter was about the identity of the “real” Annie Moore, first down the gangplank at Ellis Island. The book is a great way to get excited about family history research. Next, it was on to Family Trees: A History of Genealogy in America, by François Weil. I had the pleasure of hearing him address the summer meeting of the New England Historic Genealogical Society in Boston this year. The book describes the shifting landscape of the who, the how, and the why of family history research in America, from colonial times up to the present. It certainly provides food for thought; we may need to take another look at some of the “family tree” books we’ve all used as reference material! Now, you’d think that my 33 years of experience might give me some kind of advantage, when it comes to “knowing it all.” Hah! The next book gave me some queasy feelings about what I missed, or did poorly, along the way. The Family Tree Problem Solver, by the late Marsha Hoffman Rising, gives an excellent course that would benefit genealogists at all levels of expertise. Every concept is illustrated by actual examples from her research. Those “brick walls?” Using this process may provide some hope, after all. Then it was on to Mastering Genealogical Proof, by Thomas W. Jones. You’ve got to love a guy who’s become a respected expert in the field, even though I assume he had to work with the surname Jones! 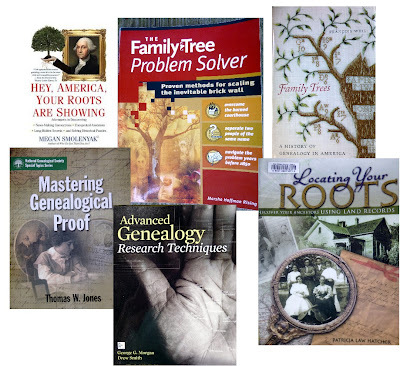 This book covers the Genealogical Proof Standard: what it is, and how to apply it. I experienced a feeling of dread when, on page two, he describes the book as being similar to a mathematics textbook. But I became engaged in the experience of reading it. Each chapter presents a concept, illustrates it, and asks the reader to answer test questions. If you’re thinking, “What’s a proof standard?” or if the start of your genealogy career began before it was established, or if you have only a hazy notion that it involves “a reasonably exhaustive search,” and “source citations,” there is much to be learned from this book. On the horizon are two more offerings, sitting on my desk. The first is Locating Your Roots: Discover Your Ancestors Using Land Records, by Patricia Law Hatcher. This is considered the go-to book on the subject, and I look forward to getting a better handle on this topic. Finally, I’ll read the latest from “The Genealogy Guys,” of podcasting fame, George G. Morgan and Drew Smith: Advanced Genealogy Research Techniques. This one assumes you’ve at least started your research, but would be useful at all skill levels. The language used is an easy read. The book updates traditional “how-to” directions for the 21st century, to include tools such as social media and DNA testing. While I’m always tempted by the lure of new research, I know I’ll benefit more from taking a spin past all of my old “brick walls,” and seeing how much I could accomplish by applying these important techniques.